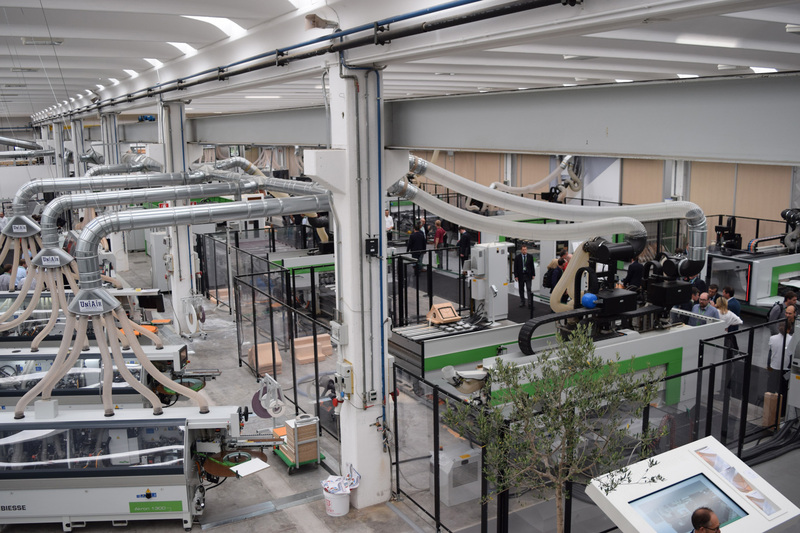 PESARO, ITALY - A contingent of North American woodworking industry professionals were among the thousands on hand to see 49 high-tech wood processing solutions and full production systems at the annual bInside (Biesse Inside) event. 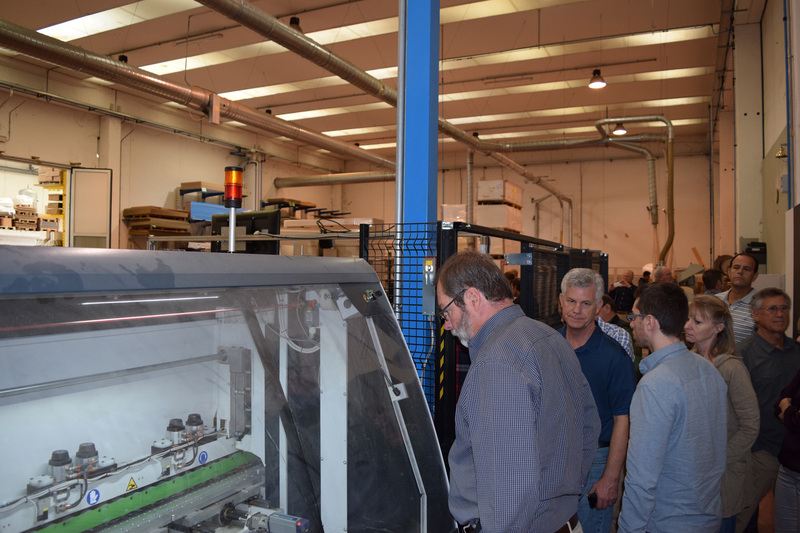 The three-day event took place Oct. 15-17 at the machinery manufacturer's headquarters in Pesaro, Italy. 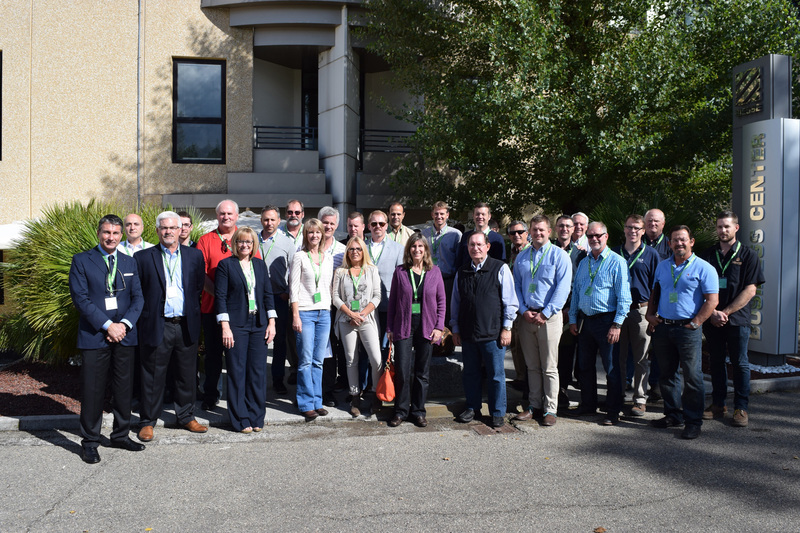 The visit to the 5,000 square meter (16,404 square feet) Biesse showroom and bLab software demo area capped off a week-long technology tour by 23 North American wood products manufacturers (see picture below) that included visits to six cabinet and furniture manufacturers throughout Italy. 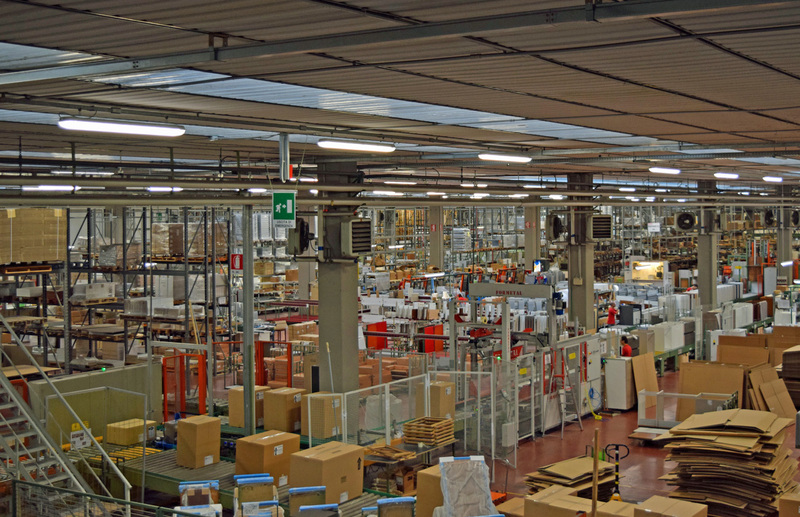 Click here to also read articles on the manufacturing operations at Italy's Scavolini and Colombini, Aran Cucine and Lube, and Lago and Caccaro. 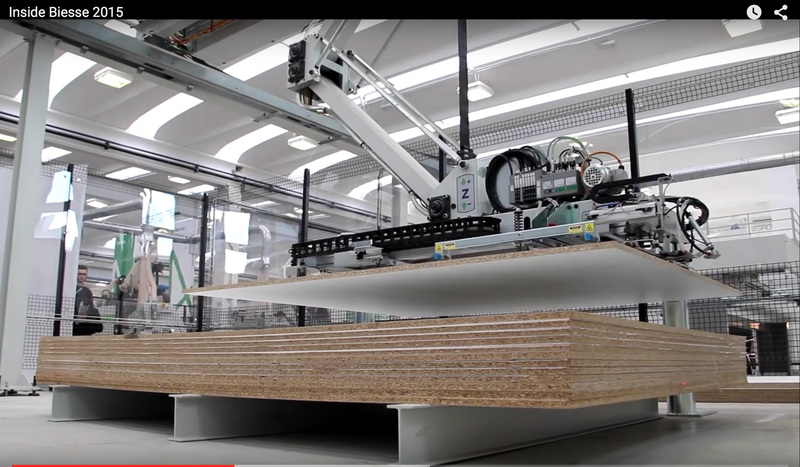 The focus of this year's bInside event was Think4Ward, which dovetails with the Industry 4.0 factory automation theme pervading the wood products industry. "For us, 4.0 is not simply a number representing what has been hailed as the new industrial revolution, but a real commitment that Biesse has made to our customers, with a view to uniting them with our '4.0 ready' technologies, to achieve levels of efficiency which today, more than ever, are crucial for keeping abreast of the competition in an increasingly global market," said Federico Broccoli, Wood/Sales Division director and Subsidiary Division manager. "We really believe in this unstoppable industrial process, so much so that we have come up with a a clear-cut business plan to invest in 'systems-oriented' human resources, with a view to further disseminating the culture of automation among our customers, including medium and small businesses, and offering them guidance through qualified personnel to help increase their competitiveness." The showroom floor featured a range of technology, including: CNC machining centers, edgebanders, boring and inserting machines, calibrating and sanding machines, and flexible beam saws for batch one processing. In a press conference with international journalists, Broccoli noted that while CNC machining centers have traditionally accounted for slightly more than half of the company's sales, sanding and edgebanding, particularly innovations in zero-edge banding, are spurring growth in those segments. Broccoli also detailed Biesse's commitment to producing machinery for other materials, including plastics. 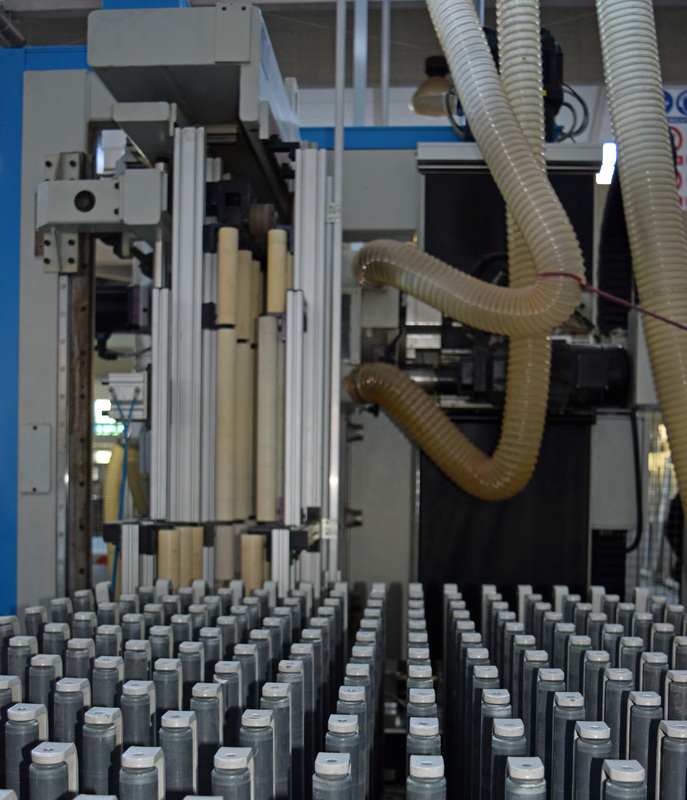 He noted that while Biesse has "always been supplying" equipment to the rigid plastics market segment through its saws and routers, the company is now pushing it to a greater level commercially, including the development of a new, specific plastics division, part of the company's 2016 plan, Broccoli said. "We're going from advanced materials reactive to advanced materials proactive," he told journalists. In related news, the company announced that starting Oct. 15 it would be added to the FTSE Italia Mid Cap stock index. The Biesse Group has approximately 3,000 employees worldwide and 24 permanent showrooms, including four in North America: Charlotte, North Carolina, Los Angeles, California, Toronto, Ontario and Montreal, Quebec. Pictured in front of the Biesse building are: (front row, l-r) Federico Broccoli, Biesse; Randy Jamison, Biesse America; Jill Standage, Classy Closets; Lori Hamblin, Classy Closets; Stephanie Parmer, Closets by Design (GA); Karen Koenig, Woodworking Network; Bill Weaver, Canyon Creek Cabinet Co.; Casey Bell, Bellmont Cabinet Co.; Steve Bell, Bellmont Cabinet Co.; Chad Grimm, Load King; Donnie Batten, Load King; Jed Richards, Holland's Custom Cabinets. In the back row, ( l-r) are: David Shamir, OFGO; Cory Shamir, OFGO; Sherwood Hamblin, Classy Closets; Stephane Fortier, North American Cabinets; Clay Smith, Royal Cabinets; Duane Standage, Classy Closets; Sebastien Madore, North American Cabinets; Steve Parmer, Closets by Design (GA); Ken Carella, Load King; Jeff Caldwell, Bridgewood Cabinets/Hi-Lo Industries; Bob Foote, Canyon Creek Cabinet Co.; Charles Chupp, Load King; Jason Varelli, Biesse America; Jim Caldwell, Bridgewood Cabinets/Hi-Lo Industries; and Rick Lovorn, Canyon Creek Cabinet Co.